This is fantastic on an absolutely epic level. Be sure to click through to see more pics. A few years ago, French photographer Sacha Goldberger found his 91-year-old Hungarian grandmother Frederika feeling lonely and depressed. To cheer her up, he suggested that they shoot a series of outrageous photographs in unusual costumes, poses, and locations. Grandma reluctantly agreed, but once they got rolling, she couldn't stop smiling. Its wednesday, and that means, HAPPY WEDNESDAY!!! Great photo's, With beautiful contrasts, between old and new, flying and not beeing able to walk and of course the beautiful rich colors. What amazing photos, glad they made his grandmother smile, they made me smile too. I love your blog, I too think there could be more cheese in this world!! Loving the fact that a 91 year old grandma is in the pics. My own grandma died earlier this year and i could just imagine her laughing her head off looking at the pics. So thanks a lot for helping me think of my grandma and making me smile. PS I am loving that car. Hihi. Very funny pics! Made me laugh a lot! It"s definitely a therapy that works on everybody!!! It's a great therapy and a fantastic way to create. Surely his grandmother never forgets that moment and she will smile every time she remembers, like us. I think I will copy this initiative. Thanks for the idea. I love the choice of colours used in the "super suit." They're somehow reminiscent of days of yore, which seems to mirror the age of our new favourite super hero! The last picture is great! How did you get your Grandma to be so active? My Grandma is only 70, but acts as if she were 120. Cool concept and if you think of how I can get my granny away from the TV, let me know!!! How do you suppose he got the shots where it looks like she's flying? These are great photos, I could never picture my granny going this but maybe she's just never had the chance! I need a Supergrandma NOW! When can I ask for one?? Thanks for the inspiration & Keep sharing those happy thoughts! Heya I just simply love your Blog! i think you very creative and inspiring btw u post quiet a lot bout the cat. do you have one? I'ts hard to think that a lot of people doesn't care about old people, without knowing that the youngest it's not in the body, but in the spirit! Don't you think? I love the pics!! Congrats!! Not surprised by grandma feeling very happy again! Are there more of these works? Well, every grand mum is a Kind of super hero, just think about it they cook, bake, clean, play with kids, and the house is always neat and the food always ready warm on the table! How they do that? They must be some kind of superhero right! So this is basically the secret life of grand mum, when you are not there they dress up and do wonders (not only in the oven!) Grand mum forever!!!! Do you agree?? I am watching the pictures again and again, it is so great. Btw how did you manage to take the pictures where grandma is flying? Very nice blog you have! First I thought is was my own grandma, because she is a SUPERHERO too!! My superhero. I only have to call her and she makes me happy. She never complains. Her age is 78, but you think she is 28, my age. She makes me HAPPY! Sun on your path. Happy days. Amazing Story! It just goes to prove that a smile goes a long way! Well done to the blogger to also bringing a smile to our faces - Great Idea! Thanks to Desigual I knew about your blog and it’s just GREAT !!! I won’t have any possibility to get a present from Desigual…. UNLESS you sent me a tiny little message with my name… Would you do that??? What are you waiting for? Your blog has now a nice place in my favourites…!!! Oh well! How can she stop smiling in doing it while I can't stop smiling myself!! I find it very unusual for people of a certain age to be "brave" enough to be involved in such crazy things. For their time, for their ideals, their way of thinking that is absolutely different from ours! Thanks for sharing this, be happy and continue to smile! Helloo! first, congratulations for these pictures, are fantastic! Have you taken these photos? I have laugh a lot with them, Have you got more blogs like this? gime me the links please! I hope you don´t stop make me laugh! I wait for your answer, thanks for make me happy for 5 minutes! Such a sweet back story as well. I wonder what other work Sacha has done of a similar vein? They put a big smile on my face! Can we watch the photo's at an exhibition somewhere in a gallery? I had a really bad day today, but those pictures and this story really made my day. I can not believe this grandma is such a HAPPY person. I would love to be like this some day. I guess I will have to start smile right away, so my children and grandchildren will know that smile and happiness are the most important things in life. And do not forget to be HAPPY an SMILING. OMG that is so cool! I wish I had a super-grandma! Does this artist has more work? Love to see other ideas from this great mind. This Grandmother seems like Supergran from the TV series in 1985!!! GOOD JOB!!! I am so so amazing with this peactures. what a great story and pictures. It really makes me happy! Do you know when the pics were taken and how old the car is? I would love to know! Bridget, Great find with the photos. My grandmother can't fly but she can cook an amazing potato soup and of course it has cheese! Let me know which is you favorite hard or soft cheese and I'll give you the rest of the ingredients? By the way, I love the photo of Grandma stopping a green car!!! great job and so original!!! I laughed out loud right here, this is just hilarious and amazing, how did you find out about this project? Keep up the great work! It's great to find notebooks like yours. All the Happy Grandma are Superheroes!!. Thanks for share! great awareness therapy! Love the story you posted with it, makes it a lot more intriguing especially in those days where people seem to forget the basics of life., but what's your personal interest in these pics? as long as she is HAPPY! Heroic indeed! It's great she kindda' seems to be enjoying it... though, in regards to the photographer, do you know if she's been or still is exhibiting any of her works and where? my roommate here in germany is from wisconsin, too. 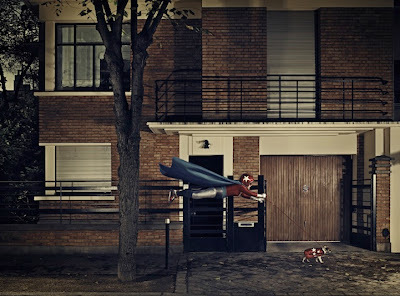 i am really in photography and i do like these Grandma's Superhero Therapy a lot! do you have a homepage with a portfolio of your work? i am curious and would like to have a look at it. you should have a look at it and write how do you like it! These are some really interesting photos. Very artistic. It cheers me up for a sleepy day! How did you find these photos ? Oh my god, they are so hilarious! It is astonishing that someone at that age acced to do that ! hahahha, really amazing photos, and she seems so happy! how do you find the grandma? I am french and I have just dicovered your blog! Congratulations! I love that pictures, and will look at my grandma very differently now! 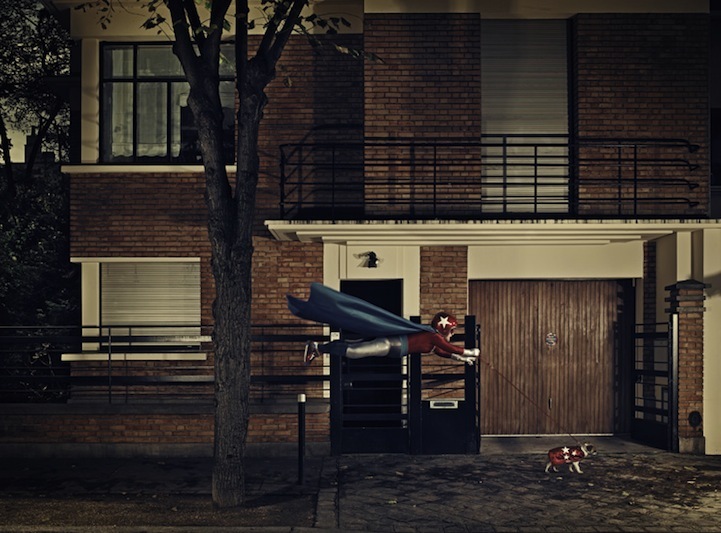 I wish here was more poeple such a Sacha Goldberger ;-) He makes many of us happy. Aw man these pictures are boss! where did you get the inspiration to make these? 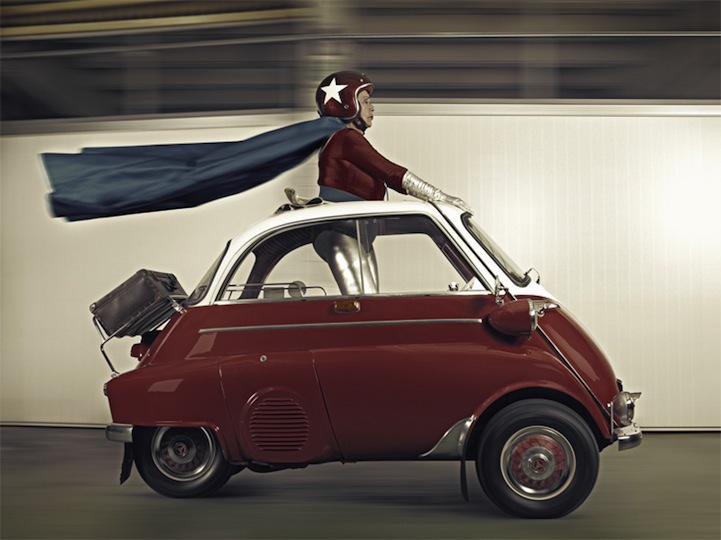 Nice photos, Do you know where Sacha Goldberger publish his work? sp please answer to nessi, ok? 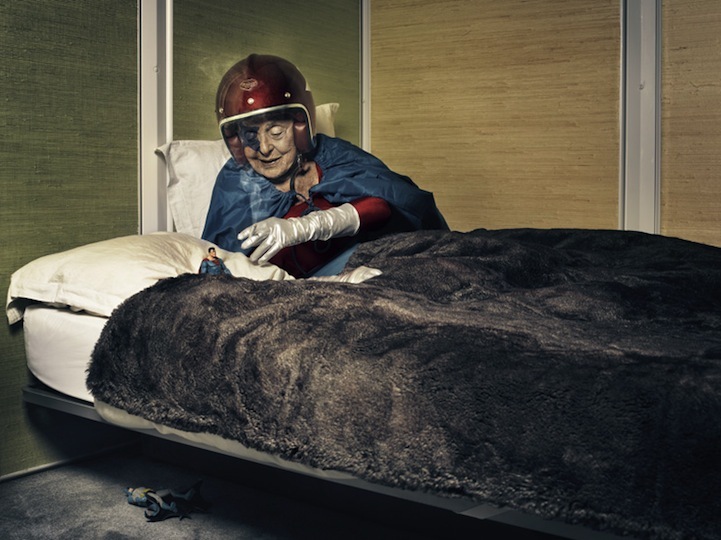 Epic pics endeed, Very funny that one when she's lying on bed with that mini SuperMan, hahaha! I have a grandma like this! Long live grandmas!! Such a great way to say to the old one that they care about them. I love the way she was photographied because make her invincible!! How cool that a photoserie also changed her from being depressed to someone smiling :D Love them! my kind of a Granny!!!! HAPPY NEW YEAR!!! BROTHER!!! Since España!!! Amaizing!!!! it's very funny!!! Good Job!! I recommend to take a view to antiheros blog... you will love it. I swear. My grandma is my star, the one I wanna follow, and she is a really superhero to me... Always there when I need!! Keep posting great stuff like this one... I loved it!! Keep up that good work... Golfinha. Old people and there therapy :) I whish all the old people over the world will do this therapy! Than we have a save lovely pleace to live! And the old people have a better thing to do. In the hospital where i work the old people are sad and have no fun things to do. Make the old people happy and introduce a grandma's/granddad's superhero therapy school! I want you to have a beautiful day. And my message to draw a big smile on your lips. Eh, what's up here today??? A bit completely overcrowded! Thank you for stopping by and for explaining what this whole thing is about. I was completely baffled by my in box this morning! Please pass on the following to your roommate - Go, Badgers! I'm rooting for you - I hope you get your coat! Thanks for stopping by and for the kind words. I appreciate it! This is a great therapy, I love the pics and I think this grandma is super and she shouln´t fell depressed. Great blog, i love it!! I think it's amazing how you keep managing to find things like these. The story, and these pictures are superb! Especially like the last one. Do you know if I can find prints for sale? Wow, that is a great series of photo's! It certainly brightened my day, browsing the internet after coming home from work. Where did you find this? Have a lovely day/evening! Your blog is awesome, i love it! this granny is just TOO COOL. Beautiful post!! I hope than when I´m old has the same energy and overflow the same happiness that this woman! Where can I buy a poster??? I like it!! Be happy happpy my find!! And it´s so nice to be a happy hunter !! Thanks for your reply!! I would like to give the present to my girlfriend for christmas!! Ohhhhh!! This is very funny!! Sorry for my bad english..I'm spanish and now I'm going to English's class!! jijij!! So I can practice my English!!! Your work is fantastic!! very well!! I hope you answer me because I love to have one of those winter coats!! Pleaseee! Hahahaha.... it's so amazing. Still wonder how the Photographer convinced the Grandma to do all those shoots. She has good stamina and imagination for 91 years old! Do you imagine your parents like a superheros??? It reminds me of 'Super Gran', wondering if that's inspired you to post these photos? It reminds me of 'Super Gran', wodering if that's inspired you to post these photos? Love the idea! It is so nice that Sacha did this to make someone feel better! 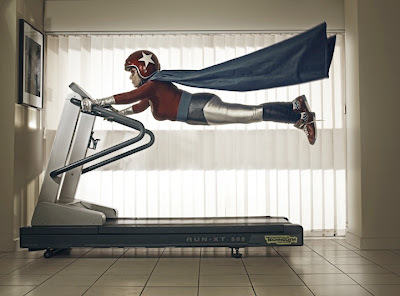 He could be onto something, I can almost see the movie concept now; Super-Grandma - You'll Believe Your Grandma Can Fly! What do you think? great is amazing and enjoy whit is grandmother too many people see our grandmother and i think that is a relity by everyday. I love it! I did laught too loud when I saw it! BTW, what does means "bb" fom bb-blog? Great idea. It's very original. A new way of entertaining people. I would like to be a supergirl and kill bad boys..
A Big WOW from out the Netherlands! Beautiful cool pictures. Nice colors and supercool idea! Has a nice message too.. Even if your older you can be super! So many people are afraid to get older, but these show them that you can be a superwoman no matter what age! Where did you find these photo's? I'm loving the Super Gran pics. Especially the one on the treadmill. That'll make me laff all afternoon as I show it to everyone around the office. Now that's a great idea t make someone enjoy life again! Even at that age. keep up the good work of making people smile and happy! I love energetic people like this grandma! I can imagine how funny it should be creating and taking the pictures! Don't you think so? Hi BB, I love the Super Granny pictures. I showed them to my kids and they couldn't stop laughing. I love the one where she stops the little car. And the one where she eats a "hotdog". Brilliant! By the way, what is an information architect?